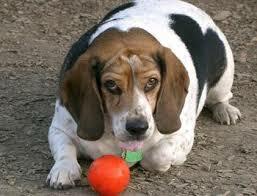 The over-weight animal has extra stress on joints even when undertaking a ‘normal’ range of activities. Arthritis at a younger age than would normally be expected is very common, particularly in animals with pre-existing joint or conformation issues. This extra stress leads to the progression of joint degeneration and creates more pain. Weight management alone decreases and can even eliminate the need for arthritis medications. The problem is compounded as joint pain leads to poorer mobility, which in turn leads to greater obesity. Cranial cruciate ligament disease is one of the most common orthopaedic conditions we see. It can occur as an acute traumatic ligament tear after whilst running, jumping or twisting similar to human footballers, or it can be a progressive degenerative condition (common in middle-aged, overweight larger-breed dogs such as Golden Retrievers, Labradors and Staffordshire bull terriers). In most cases, a surgical procedure is required to stabilize the joint, and ongoing arthritis prevention or management is required. Intervertebral disc disease leading to disc rupture and acute spinal cord compression can cause permanent paralysis and is often life-threatening. This can occur with little warning particularly in dogs which are pre-disposed ie. Those with short legs and longer backs such as Daschunds and Corgis. Excessive weight increases the likelihood of these discs giving way, particularly if vigorous activity is encouraged in a pet that is already overweight but coping with its subclinical disc instability.